On the eve of our Independence Day, an ultra-antagonistic independence – one that manifestly threatens to replace ours – is fast gaining ground. Many Israelis are appalled to see the Ramallah and Gaza splinters officially welcomed in UN-affiliated forums as the State of Palestine. However, given relentless global trends, this travesty was all but inevitable. “Palestinian independence” had already been declared in Algiers on November 15, 1988 and within mere months the utterly fictional entity was recognized by 134 of the UN’s 193 then-members. All this transpired before Oslo proved how a previously bad situation could be made disastrously worse. By now, of course, few abroad challenge the popular axiom that a Palestinian state had existed in this country from time immemorial and that it was cruelly overrun in an act of unprovoked aggression by Israel on June 5, 1967. Even since, it’s alleged, the state of Palestine had been under occupation. In other words, Israel had violently extinguished Palestine’s flourishing sovereignty. This is today’s self-evident, universally worshiped gospel. No substantiation thereof is necessary and any deviation therefrom is sacrilege. In fact, the truth is remarkably unwanted in this context lest it expose the entire fable as fake. No one wants to know that there never-ever was a Palestinian state – not in the entire annals of mankind. There are advantages to deception, especially when it yields realpolitik perks. Thus the dysfunctional family of nations is more than happy to clasp to its selectively loving bosom another fabricated Arab addition. The corollary to the much-censured Israeli conquest of an independent Palestine is that independent Palestine had thrived in all the territory that Israel took after June 4, 1967. The demand that Israel retreat to the June 4 lines is, consequently, endowed with moral authority. Each time the Ramallah honchos and their Jihadist partners in Gaza repeat the 1967-borders mantra, it packs greater punch. It matters little to cynical propagandists, sanctimonious fellow-travelers, gullible do-gooders and know-nothing dupes that there never were 1967 borders (but only 1949 armistice lines, which don’t remotely resemble fixed borders). The current bogus standard for elementary justice is that these 1967 borders (that never-were) must form the basis for any deal between Israel and the callously conquered Palestinian state (that never was). This is now the bedrock dictum. Zealous enforcers and sanctifiers of dogmas suffer no skepticism. Whatever they promote as incontrovertible principles must be accepted as incontrovertibly unassailable. Whatever serves their interests and/or belief system cannot be challenged – otherwise it might undermine the paradigm of whatever they present as an absolute. And so we’re left with an assertion that a preexisting Palestinian state is oppressed by Israel and that to redress this injustice Israel must withdraw to the June 4, 1967 lines. This, we’re told, has been the position of the whole international community from the outset and this position had already been enshrined in UN Security Council Resolution 242 (adopted unanimously on November 22, 1967). That resolution was hardly Israel-friendly. It began by laying down a rule that applied exclusively to the Jewish state. That rule determined that “acquisition of territory by war is inadmissible.” All other acquisitions of territory by war were expectedly overlooked. Just as expectedly, the UN also overlooked the fact that East Jerusalem, for example, had been under Arab rule solely because it was acquired in 1948 by an act of war launched to thwart UN Resolution 181 (the Partition Resolution of 1947). Likewise, there was the minor matter that Israel was defending itself in 1967 against the coordinated and hoarsely broadcast belligerence of all its Arab neighbors who unabashedly vowed to annihilate it. For weeks, the intention to destroy Israel was proclaimed vehemently and vociferously but the international community wasn’t overly perturbed by the prospect of extinguishing Jewish independence. Indeed the UN shamefully pulled out its peacekeeping forces from the Sinai to facilitate an Egyptian attack. Nonetheless, all that appeared to pale before 242’s demand that Israel withdraw “from territories occupied in the recent conflict.” This was seized upon by the Arab world, its many accomplices and cheerleaders to unequivocally mean a full return to Square One. Israel had to plainly hand over all it gained in a classic war of self-defense. This became one of the most blatant (and successful) distortions ever, even when judged by the distorters’ dishonorable record. Resolution 242 simply never said what world opinion is bamboozled into taking for granted. 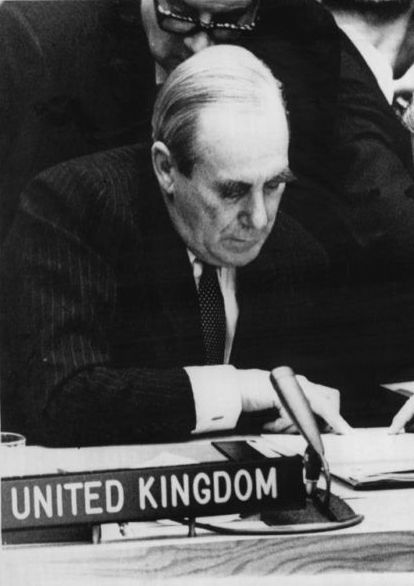 Lord Caradon wasn’t alone in maintaining that Resolution 242 didn’t mandate a return to the status quo ante. Many others who played key roles in formulating 242 attested similarly. Nowhere in 242 was a Palestinian state ever mentioned. Neither was Jerusalem ever mentioned and certainly not the Johnny-come-lately demand that it be recognized as the Palestinian capital. According to today’s mind-blowing misrepresentation of 242, it isn’t as if the final borders are to be determined by future negotiations but that reinstating the June 4, 1967 lines is compulsory. This is the diktat. It must be implemented rather than discussed. Gradually and deliberately, all the partial prudence mustered in 1967 was obfuscated and unconscionably warped. Resolution 242 was manipulatively deformed into the quasi-religious two-state doctrine. The key UN Resolution was first calculatingly counterfeited as obliging Israel to a full and unconditional withdrawal from every inch beyond the 1967 starting line. Later “fine-tuning” centered on the establishment of a Palestinian State with Jerusalem as its capital. Neither figment had yet been invented in 1967 but both are nowadays treated as if they were cardinal components of 242 from its inception. With frequent repetitions, the two-state premise gains priority in indoctrinated psyches. Memory is reinforced with each tendentious news report and skewed analysis until the preaching becomes an axiomatic irrefutable precept. All this empowers Ramallah Figurehead Mahmoud Abbas to demand that Israel shrink itself into the existentially perilous 1949 armistice lines, the ones super-dove Abba Eban called “the Auschwitz lines.” Abbas insists that Israel surrender Jerusalem. He refuses any compromise, especially over territories he doesn’t control. In the revised spirit of 242, Abbas has of late brazenly denied that he had ever agreed to “let the Jews keep” the Western Wall. So much for idyllic coexistence alongside a secure, accepted and recognized Jewish state, “free of threats or acts of force” as stipulated in 242. Two-state harmony has never been the Arab endgame. Coercing Israel to sign articles of capitulation to facilitate the Jewish state’s ultimate demise is what it’s all about. …… and to trust ANY of the players (from 49 to the present day), to be true to their words, in this sad on going saga, is to continue on a fool’s errand. Much of the bloodshed in the region is as a result of British intervention and short sided policies. But there again the penchant and leaning towards Arabia at large has always been a British failing and Achilles Heel. Whether it be Caradon or Carey, it ill behoves us to trust any of them. Their interest in the region is due to self interest, profit and power, and this factor should never be underestimated. Frankly I do not believe they “give a dam” about Israel or Jews at large. The amateurish weakness shown by the Israeli negotiating team in the recent disastrous peace negotiations; by releasing murderers and cutthroat brigands, (supposedly as an opening gesture), was and will continue to be a misguided policy. The alleged pressure laid on Netanyahu to release the prisoners should have been resisted and used as a negotiating point. Whether the analogy of Poker or Chess be used, we subsequently started from a point of weakness and have gained “babkes” -nothing!!! In fact we lost. These words encapsulate the entire Middle East situation perfectly. One can write thousands of words and tens of millions of words about all that has happened and been said since 1948 but in the end it all comes down to the same thing. That is to say- the world for thousands of years has wished to be free of any Jewish presence. Many believe, and it is partially correct to assert, that much of the hatred directed at Jews, stems from the false belief that the Jews were responsible for the death of a person called “Jesus”. Thus the assertion that the Jews are the “Christ killers” and must pay for that “crime”. But the truth is Jews were hated and persecuted long before a person now identified as “Jesus” arrived on the scene. The essay at hand, as always, makes numerous important points, brilliantly exposes all the falsehoods and intentional historical distortions and would trump any opposing ideas and/or positions in any debate that contained even the barest semblance of fairness and objectivity. But I often find myself stepping back a few paces and wondering about all the millions of words written and spoken in defense of the Jews and the State of Israel. Will such efforts, in the end, really make a major difference ? Will such efforts to explain the historical facts and advance the cause of “truth” change anyone ? The answer to that question can be found in the event/s of the Holocaust. The entire world, despite their denying it, knew full well, as early as the beginning of the 1930’s that the Jews of Europe were being seriously persecuted and killed in large numbers. It was only a matter of time before thousands became tens of thousands and then hundreds of thousands and then millions. Anyone with the least sense could clearly see both the “virtual” handwriting on the wall as well as the actual painted handwriting on the walls and store windows of Europe. Witness the thousands who literally ran for their lives- to South America and even as far as China. But of course most thought and absolutely were convinced that bad as things were getting, that the “unthinkable” could never happen. After all, they believed: “You can’t kill millions of people just because they happen to be Jews ! ” Really ? But as the unthinkable began to unfold, the entire world averted its eyes and even America, the bastion of Democracy, closed its doors. Even worse, while almost every nation in Europe eagerly assisted the Nazis in the hunting down, rounding up, identifying and deporting (or instant killing) of Jews, the US State Dept. cravenly did all in its power to stop Jews desperate to escape Hitler’s gas chambers, from reaching American shores- as is now more than well known. Thus all the efforts to combat the current vilification of the Jews and the State of Israel all around the world and in particular in the halls of the United Nations is really actually quite futile- however necessary such efforts are from a moral standpoint and for the sake of historical truth. If almost the entire world could stand by and let the Holocaust happen, and even in a vast number of cases assist in its happening- witness how France employed its own French police force to round up Jews, -then what makes anyone believe we can change such world thinking now. Yes- make every effort to change minds and opinions, try to educate, try to open people’s eyes. But never doubt, never be so foolish as to naively believe that anything has changed in two thousand years or that the monster of anti-Semitism is not still with us, lurking just below the surface in all “polite” Societies everywhere. The chief difference now is that there is a place called the State of Israel which is more than able to defend itself in every conceivable manner. All the millions of words spoken in defense of Israel or against the existence of Israel really in the end will change nothing. Israel is strong and is here to stay- today, tomorrow and till the end of time. In the end that is all that matters. Just. simply, thank you, David. Sarah Honig writes brilliantly, but you, concisely espouse the ultimate truth. It is ultimately necessary for each and every Israeli Jew to stand firm, shoulder to shoulder, regardless of personal ideology, with one purpose…survive and be triumphant in the face of all who would destroy us as a people and as a Nation. Can the “Auschwitz lines” be erased from the minds of the two state fanatics ? Of course not, because the combined Jew haters of the world WANT Israels demise ! There are TWO lines : the rotten 67=49 line and the Jordan valley line. NEVER IMAGINE ANY OTHER LINE. Even the original 242 resolution is antisemitic garbage and not worth even one word of discussion. The anti-Israel UN has no right and no power, to force Israel to withdraw from Jewish land.and Israel has every right and also the power, to keep it’s land. The way out is to look forward more than backward. Nobody ever gets perfect justice for all the events of the past. Seek not Justice. The call for Justice is a call for war. Seek Compromise, Safety, Security, Recognition, Peaceful co-existence, Sovereignty, and Prosperity. Wake up, Freddy! Surely you jest. It ain’t nevah gonna happen! So the 1967 cease-fire lines “aren’t satisfactory,” eh? Mr. Lord Caradon, you remind me of those who say “The United States Constitution is a living, breathing document.” That is, the US Constitution can mean anything a Democratic Senator or Congressman(or John McCain) wants it to mean. Lord Caradon and Sen. McCain have one thing in common–they’re not our friends. Thank you, Sarah, for illuminating the misinterpretation of UN Resolution 242. So where does Abbas get the idea that Israeli withdrawal to the lines of June 4, 1967, is anywhere stated or implied in UN Resolution 242? Is it because those lines weren’t intended to be permanent? They were “just where the troops stopped that night,” in 1949. How is that different from the great majority of wars in World History? All that’s implied by UN Resolution 242 is that there’s some room for negotiation. But what does Abbas want, and what is he prepared to give up to get what he wants? He’s never given a clear answer to either question. If he truly wanted a Palestinian state, he could have taken the hand that’s been dealt to him, and helped create one in Gaza and the West Bank. Someone should tell this man there’s no such thing as magic–one doesn’t create a state out of thin air. I was instrumental in establishing the Israeli National Skin Bank, which is the largest in the world. The National Skin Bank stores skin for every day needs as well as for war time or mass casualty situations. This skin bank is hosted at the Hadassah Ein Kerem University hospital in Jerusalem where I was the Chairman of plastic surgery. This is how I was asked to supply skin for an Arab woman from Gaza , who was hospitalized in Soroka Hospital in Beersheva, after her family burned her. Usually, such atrocities happen among Arab families when the women are suspected of having an affair. We supplied all the needed Homografts for her treatment. She was successfully treated by my friend and colleague, Prof. Lior Rosenberg and discharged to return to Gaza. She was invited for regular follow-up visits to the outpatient clinic in Beersheva. One day she was caught at a border crossing wearing a suicide belt. She meant to explode herself in the outpatient clinic of the hospital where they saved her life. It seems that her family promised her that if she did that, they would forgive her. This is only one example of the war between Jews and Muslims in the Land of Israel. It is not a territorial conflict. This is a civilizational conflict, or rather a war between civilization & barbarism. Jews were expelled from East-Jerusalem by the Jordanian occupation at 1948. They lived in East-Jerusalem for thousands of years. They returned to their homes after Israel liberated the city in 67.Jerusalem was never in history the capitol of any Arab country. Jerusalem has been only the Capitol of Israel. ISRAEL which is defending itself against Pan-Arabism, Arab imperialism and Arabization of the Middle East – that is the “problem AFP don’t like. The real problem is global Arab/Moslem insistence to spread hate, violence, wars, terrorism, lies, false accusations against Jews and reducing Jews to subhumans or second class citizens – slaves or servants – without any human rights. The U.N wants to help the Palestinians destroy all Jewish history in Jerusalem. Surah 9:5- Kill non-Muslims wherever you find them. Ambush, seize, and capture them. If they convert to Islam and pray (to Ka’aba) and contribute to the cause of Islam, let them go.